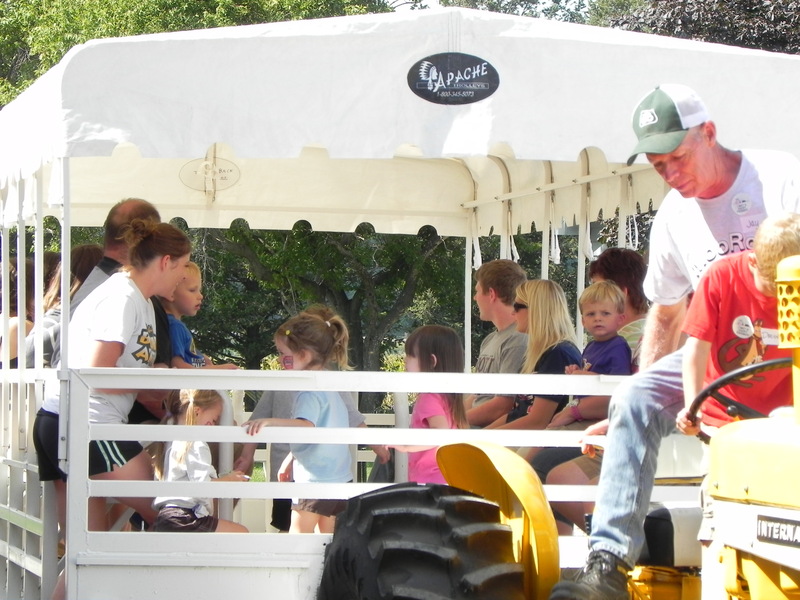 Sept. 9 is the Farm Crawl! 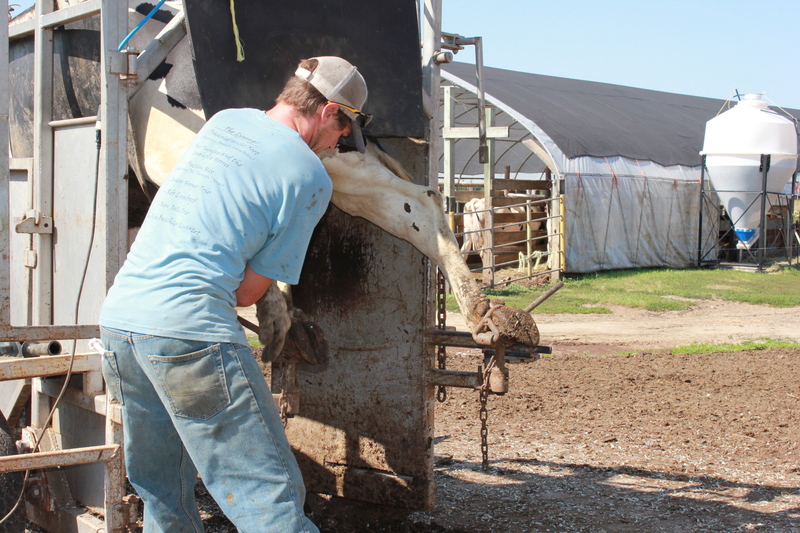 Ever wondered how milk gets from the cow to your table? 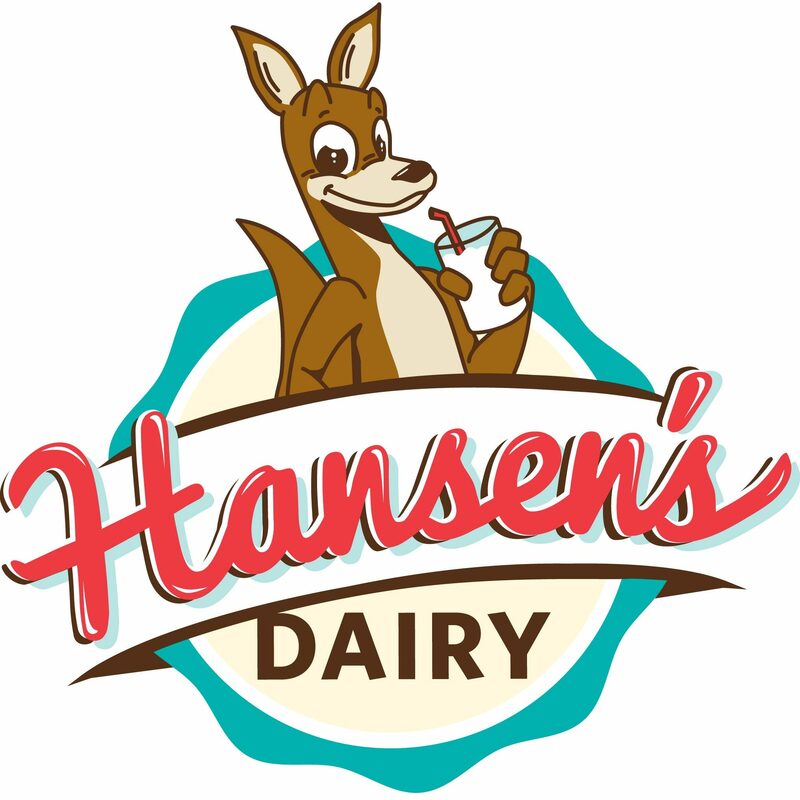 Come to Hansen’s Farm Fresh Dairy and find out for FREE during the second annual Farm Crawl, sponsored by the Northern Iowa Food and Farm Partnership. 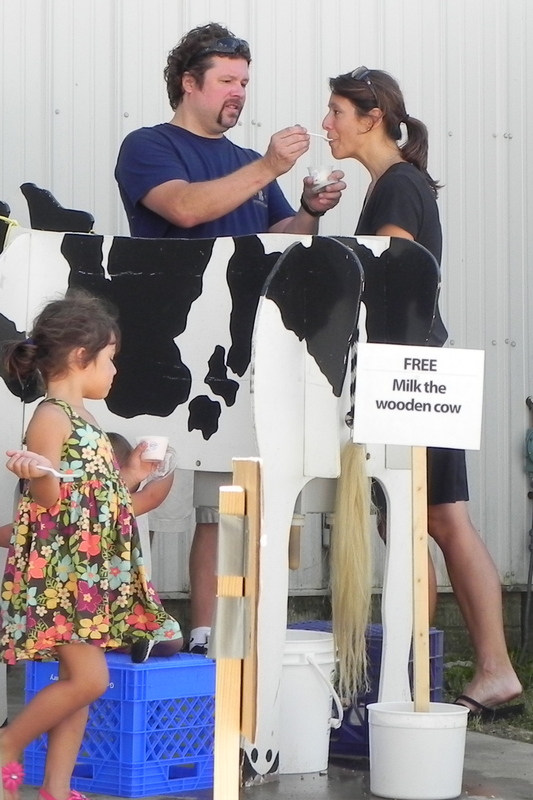 We’re offering trolley rides from our newly opened tour center; tours to see the cows, wallabies, and calves; cow milking; free ice cream; barbecued pork sandwiches; kids’ tattoos; contests; and door prizes. But this event isn’t just about us. 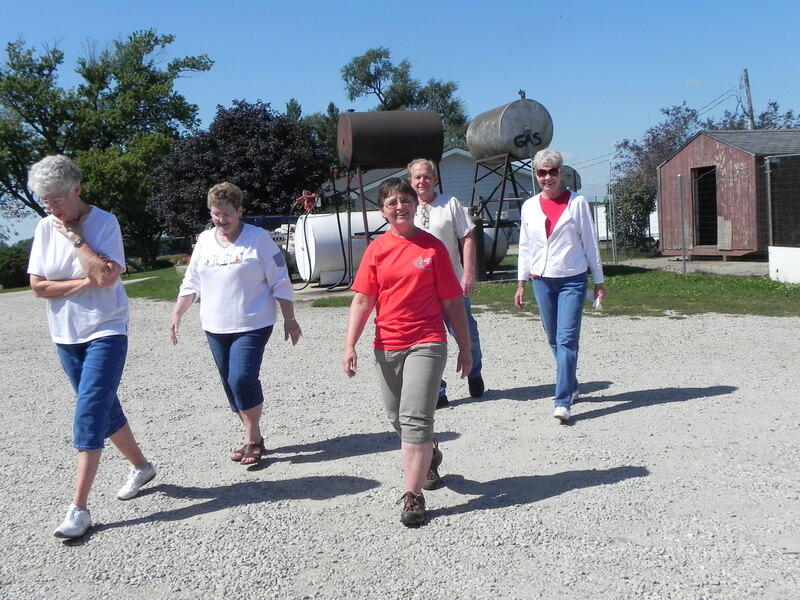 Visitors can see produce farms, livestock farms, crop farms and a winery all over Northeast Iowa during the Farm Crawl. 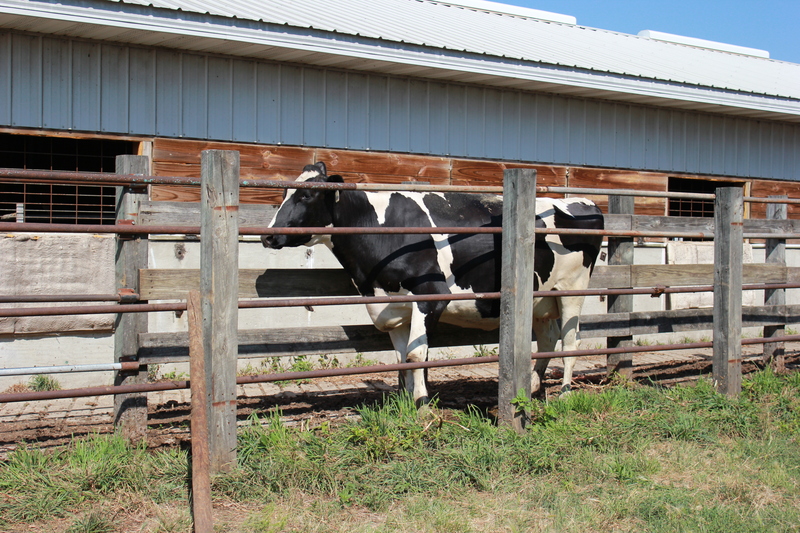 Some farms are even showcasing their energy conservation practices. The event is Sunday, Sept. 9, from 1 to 5 p.m. Visitors can roam from farm to farm, wherever the road takes them! 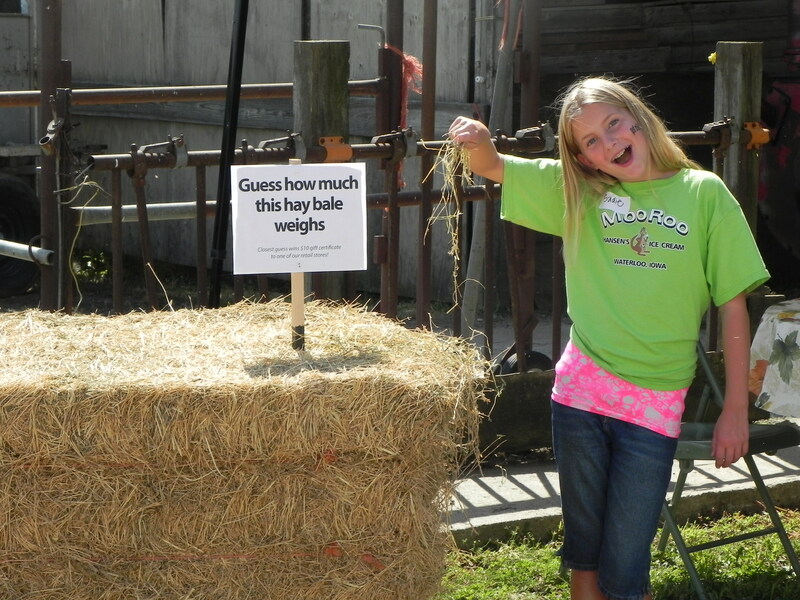 Come support local agriculture and have a lot of fun. 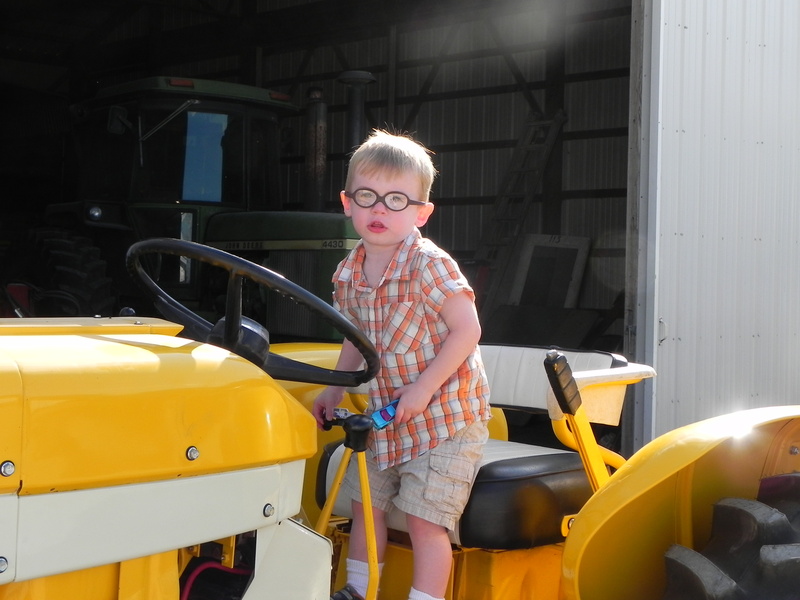 In addition to our farm, other sites include: Engelbrecht Family Winery, Fredericksburg; Hawkeye Buffalo Ranch, Fredericksburg; Genuine Faux Farm, Tripoli; Rainbow Ridge Farm, Waverly; Friedrich’s Fresh Foods, Cedar Falls; C’mon Back Acres, Cedar Falls; Fitkin Popcorn, Cedar Falls; Hillcrest Farm, Cedar Falls; Jefferson Greenhouse and Orchard, Dunkerton; and Timeless Prairie Orchard, Winthrop. 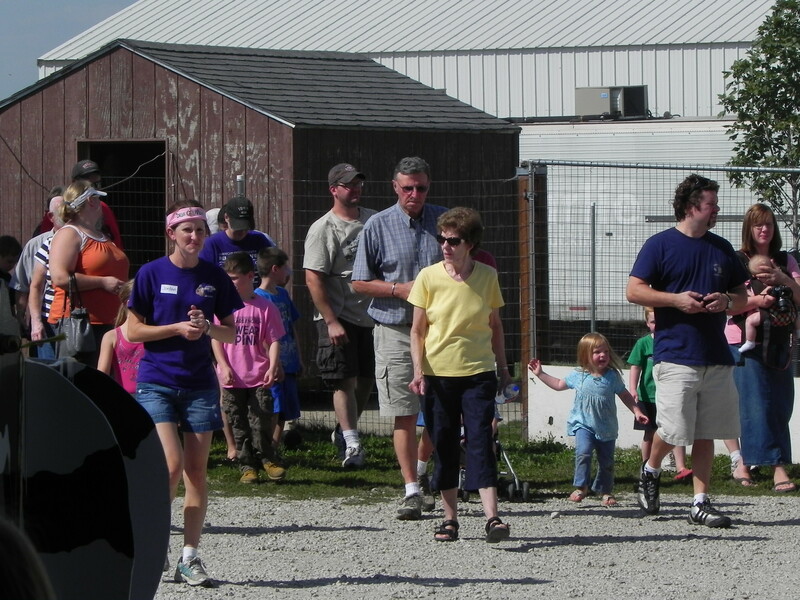 Our retail stores, Moo Roo and the Outlet, sell goods from many of the farms on the tour. For descriptions of each site, visit http://www.uni.edu/ceee/ and look under News & Events. Check out some of our photos from last year. We had a blast! 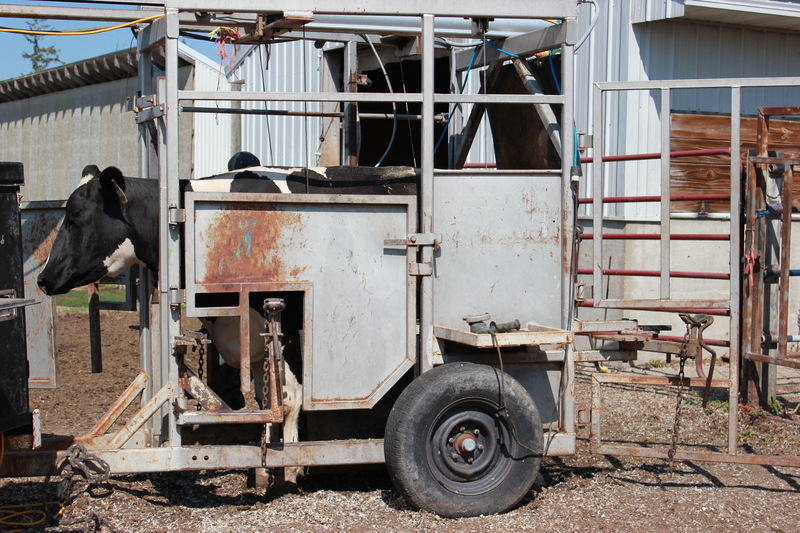 Just like horses, cows also need their hooves trimmed to stay healthy! Dream graciously offered to let us take pictures of her hoof trimming experience. Thanks Dream! Here she is anxiously waiting for her turn. When it was Dream’s turn, she stepped into the hoof trimming chute. As she’s stepping in, she steps over a belt. The belt isn’t very fashionable, but at least it allows us better access to her hooves! The belt then lifts her up, suspending her off of the ground. Just like Dream, Blair Hansen agreed to let us take his picture too! Here he is tying down Dream’s feet. This is to prevent any unwanted movement which could potentially result in an accident. Dream must have know this because she stayed very still for Blair. 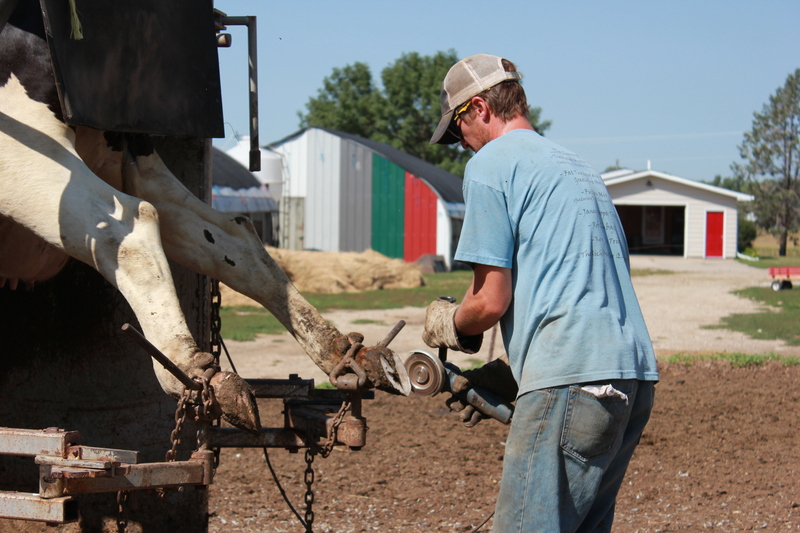 This is the tool that Blair uses to trim hooves. It’s a little bigger than your typical finger nail clippers huh? Thanks to Sadie Hansen for her lovely hands in this shot! Now we’re finally ready to get trimming! 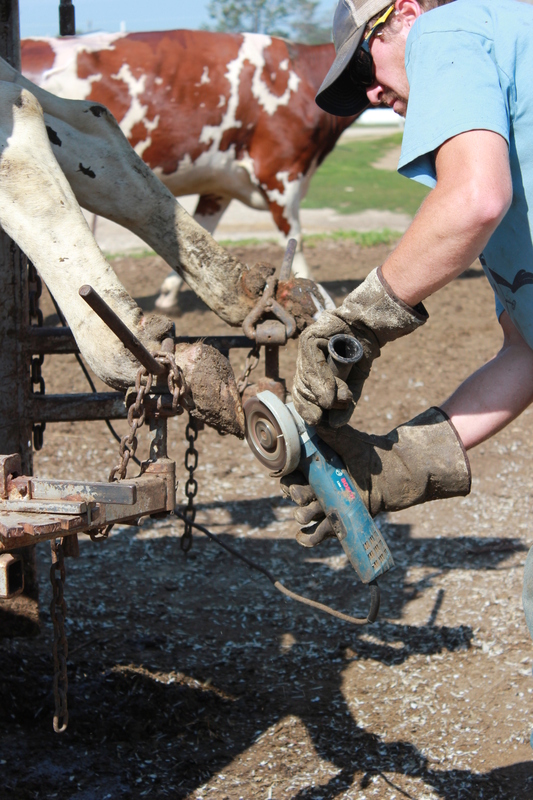 Each hoof is individually trimmed with care. Just the way Dream likes it! See all that white stuff on the ground? That’s hoof shavings from previously trimmed cows. Look at those shavings fly! After trimming the back feet, Blair moves on to Dream’s front hooves to finish her up. Don’t worry Dream, we’re all done! Your hooves are nice and trimmed, making life easier and more comfortable for you. 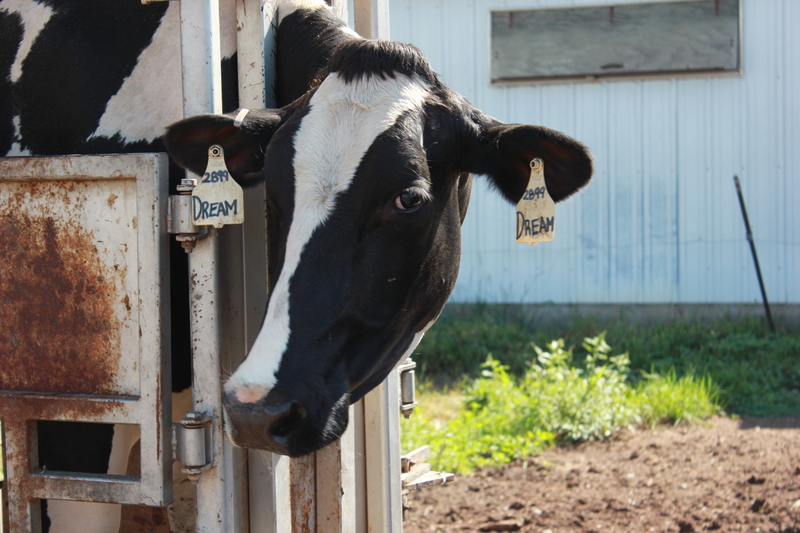 The Hansen’s trim their herd’s hooves about 4 times a year so we’ll see you again in 3 months Dream! Cow milk provides us with a number of different things. We can use it to make cheese, yogurt, butter and ice cream or we can drink the milk as is. 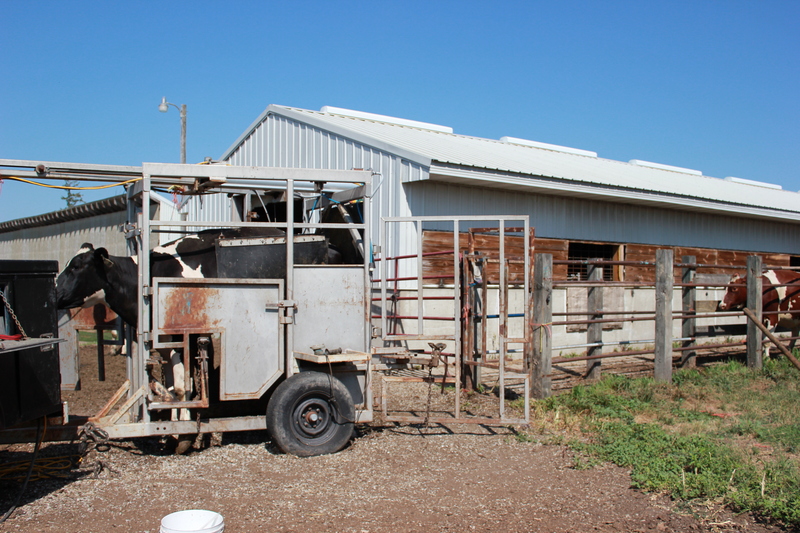 Did you know that, aside from providing our daily dairy intake, cows support our daily routine in many other ways as well? By-products from cows can be found in a number of different items that many of us use every day. These by-products allow us to utilize 99% of every dairy cow! 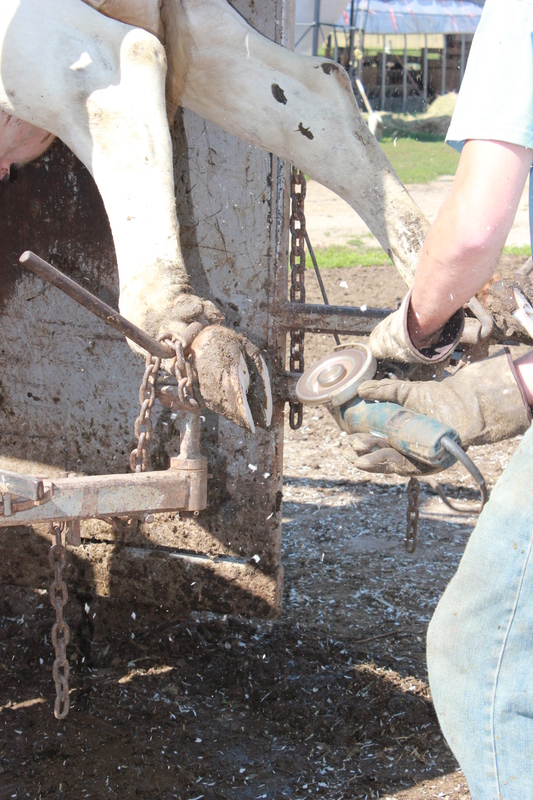 Listed below are some of the ways that cows really do touch us daily. Candles-made from Stearic Acid found in rendered beef fat. 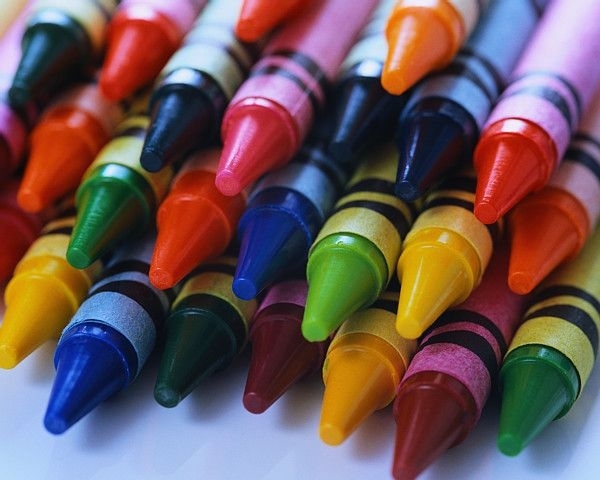 Crayons-made from rendered beef fat. Tallow and Stearic Acid from cattle are used. Chewing Gum-made from Stearic Acid found in rendered beef fat. Shaving Cream-made from Lard found in rendered beef fat. Soaps-made from Stearic Acid found in rendered beef fat. 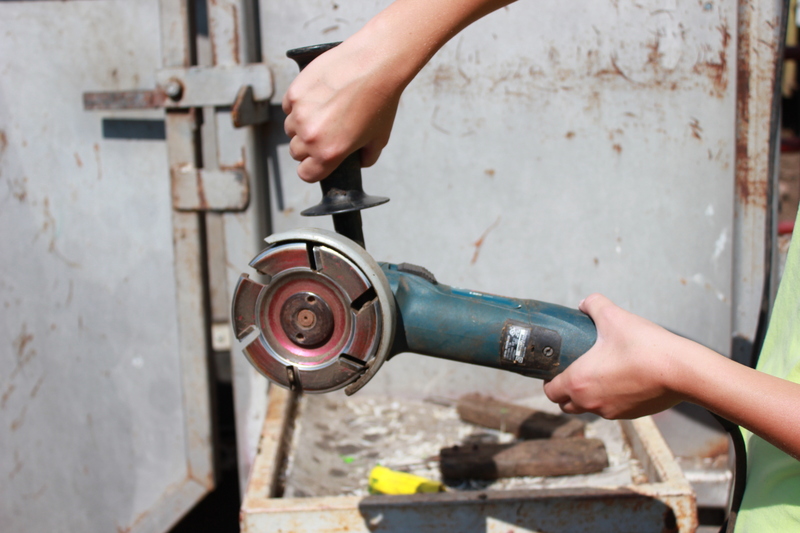 Lipsticks-made from Stearic Acid found in rendered beef fat. Detergents-made from Palmitic Acid found in rendered beef fat. Mouthwash-contains Glycerin and Benzoic Acid found in cattle fluids. 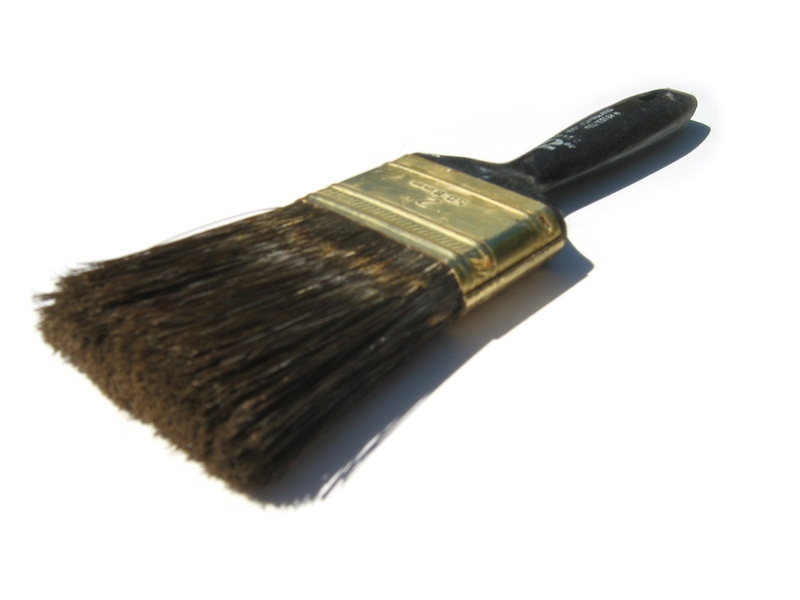 Paints-made from Tallow found in beef fat. 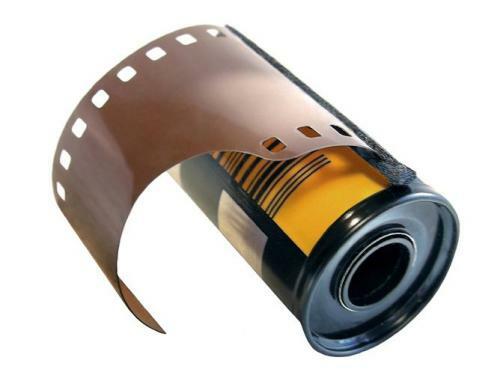 Camera Film-made from Gelatin Protein. Marshmallows-contains Gelatin Protein, obtained by boiling skin, tendons, ligaments, and/or bones with water. Cattle by-products are often used in a number of different life-enhancing pharmaceutical products as well. From the pancreas we can get Insulin to help treat diabetes and Chymotrypsin to aid in the healing of burns and wounds. From the liver we can get Heparin to prevent blood clotting and Vitamin B-12 Extract to prevent B-complex deficiencies. Other notable products include Bone Marrow to treat blood disorders and Iron to treat anemia. For a complete list and more information about cattle by-products, please visit DairyMax.org and HappyCow.net. The Hansen family had an occasion to celebrate on Sunday. Baby Beckett (son of Blake and Jordan) came home after a nasty virus landed him in the hospital for two days. He made it home just in time to celebrate his big sister Reese’s 3rd birthday. 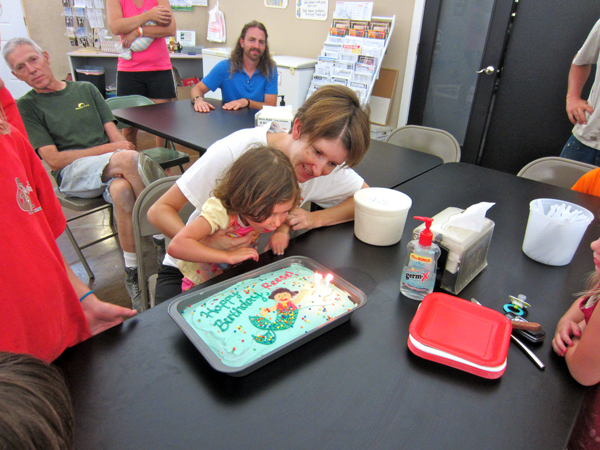 We all gathered at the dome for Dora mermaid-themed cake and ice cream. 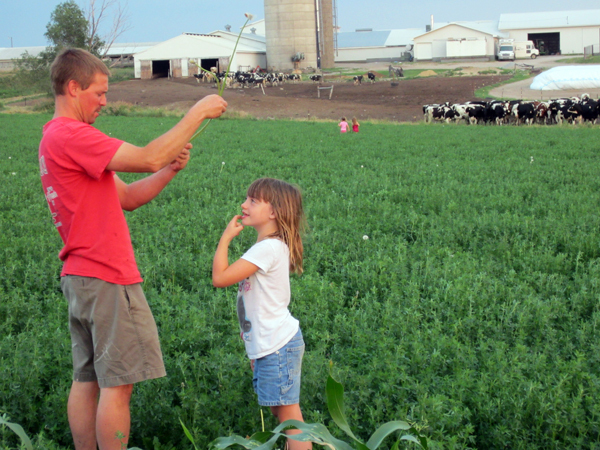 Afterward the youngsters went outside to see who could pluck the longest dandelion. 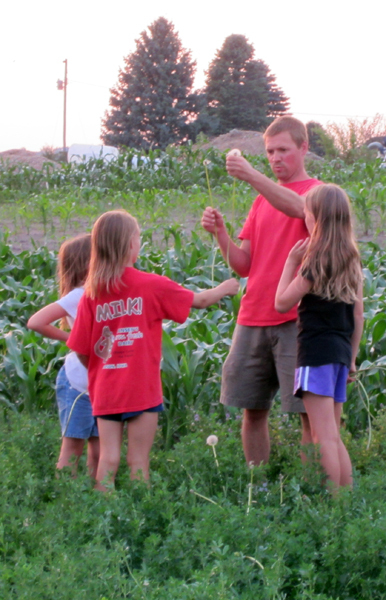 Blake is the judge while the kids thrash around the hayfield and bring back their finds. The stems are usually about 2 feet long. The cows in the background are very curious about the night’s activities. 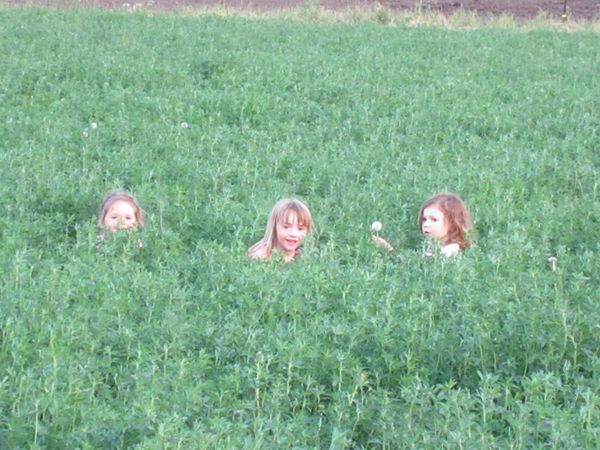 Even the little girls (Bridget, Mollie and Reese) get in on the fun and make a game out of hiding in the crops. 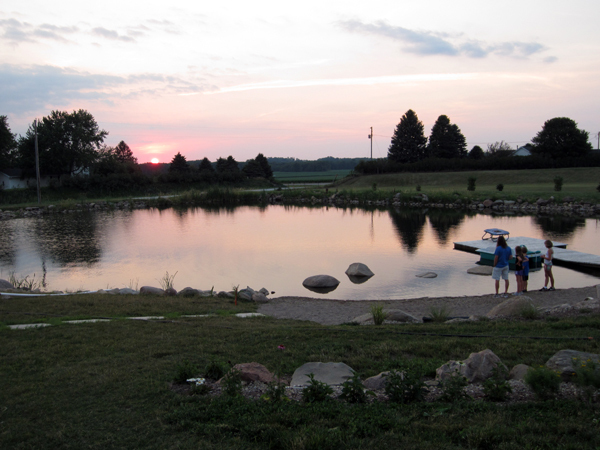 The night was capped off by a gorgeous sun setting above the pond. Brent, Sam, Sara and Sadie went down to enjoy the view. Even though we work together all day, it’s great to have some downtime to enjoy the wide open spaces on the farm with the fam. 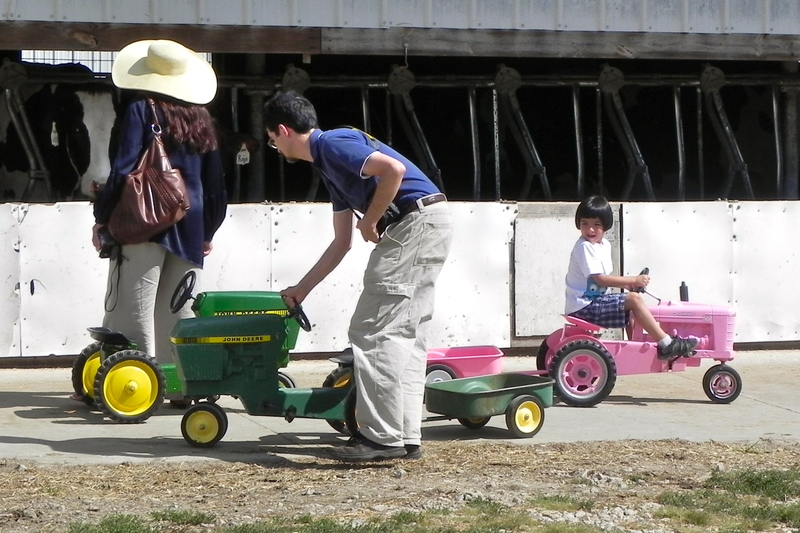 Mother’s Day on the farm isn’t just for people. Some of our cows and wallabies are moms, too! To honor our farm animal moms this weekend, we’re going to tell you a bit about them. A mama and her newborn. 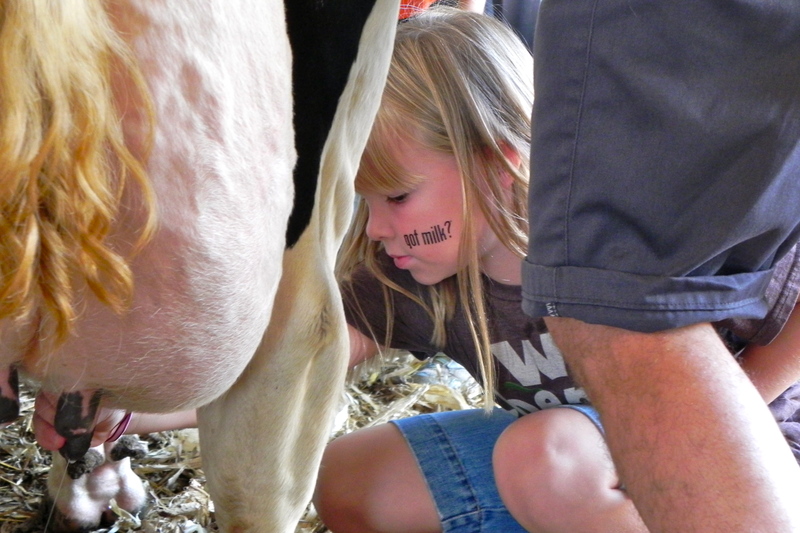 How long is the gestation period for cows? How long are they usually in labor? Cows have a 9 month gestation period, just like humans. They are usually in labor for anywhere from 3 to 10 hours. 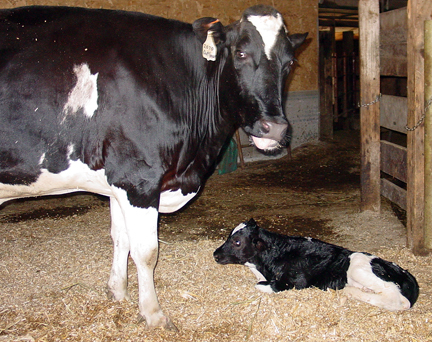 How long do calves stay with their mamas? Calves stay with their moms for about an hour and a half. If a calf is born in the middle of the night, it may be a little longer. The reason we separate them is because the mom needs to begin milking with a machine, and we don’t want the calf to get used to nursing instead of drinking out of a bottle. How many calves do most cows have in their lifetime? Cows have their first calf at the age of 2 and the goal is to get them pregnant once a year every year after that. So a 9-year-old cow has had 7 calves in her lifetime. Giving birth rejuvenates a cow’s milk supply. We’ll keep a cow around as long as she keeps getting pregnant. 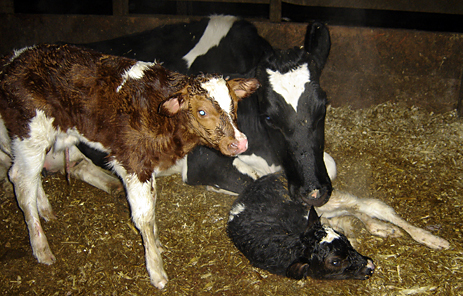 This Holstein cow had twins – one red and one black. It’s really rare for twins to be different colors. How many calves have been born on the farm this spring? We haven’t had as many calves lately as we normally do. This is because about 9 months ago, the cows had a hard time getting pregnant in the summer heat. Generally we average about one calf born every other day. Our cows calve throughout the year so we have a consistent milk supply. The gestation for wallabies is 30 days. 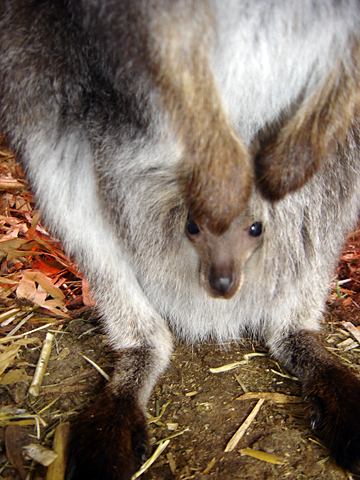 Then the joey is birthed and crawls up into the pouch on its own. The wallaby will stay inside the pouch and nurse for about a year. Right now we don’t have any female wallabies on the farm, so there won’t be any babies for awhile. We just have 1 fixed male and 2 breeding males. Their names are Pockets, Satchel and Aussie. A joey peeks out of its pouch.